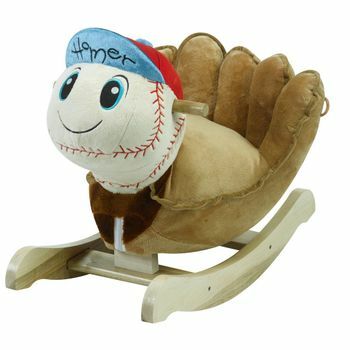 Meet Li�l Homer, a keepsake rocker that�s both educational and fun. Press one of the many buttons on his hat to play catchy songs, from the original �I lLove to Rock,� to educational tunes that teach ABCs, numbers 1-10, colors, shapes, and more. These are premium rockers with an emphasis on safety, education, and fun. Top notch fabric combined with premium North American maple wood result in a high quality, high value, Made in the USA product. Wood products, stuffing, production, and assembly are done with pride in Phoenix, Arizona. Fabric skins and music boxes are from overseas. Option: Personalize the rocker for a gift that is extra thoughtful and truly special. When you choose the personalization option (11 characters maximum), one of the wood rails will be engraved and then painted for a stand out look. Please click on More Images above to see personalization images as well as more rocker images. Approximately 24�L x 12�W x 17�H. Designed for children ages 9 months and over, up to 80 pounds. Free shipping to the lower 48 states included.